Aunt Tilly just can't get it together. After a successful beginning as a restaurateur, she moves her restaurant to an upscale community and flops. Literally within weeks of declaring bankruptcy she invites a restaurant management consultant to analyze her operations and save her business. This book describes how, with the consultant's expert help and advice, Aunt Tilly roared back and succeeded beyond her wildest dreams. It's about how to run a dining room, a kitchen, a bar, and the restaurant's financial and administrative operations. 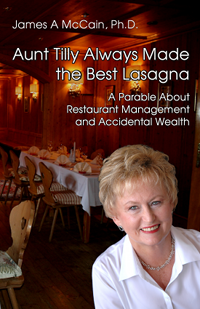 Written as Aunt Tilly's journey from near-failure to hard-won success, this book is straightforward, practical and gives you a rare insight into the author's proven experience and knowledge of running a successful restaurant and helping countless other restaurant owners to achieve their own success. James A McCain is a senior business consultant whose experience includes work with many Fortune 500 companies, including GE, Sears and Prudential, and hundreds of consulting engagements with small and mid-size firms. He has advised countless restaurant owners on the keys to success and sustained profitability and is a recognised expert in the field of restaurant business management.